Okay, so maybe Kenji Mizoguchi's 1948 drama Women of the Night wasn't the best choice for a Saturday evening's entertainment. Particularly since I hadn't even started drinking. Correcting that now. The third film in the Eclipse set Kenji Mizoguchi's Fallen Women has some years distance from the previous entry in the box, 1936's Sisters of the Gion. Damn, a whole war actually happened during the time from one production to the next, so it's fairly understandable that Women of the Night would be so tragic and bleak. The director kept making movies in that time, including his masterwork The 47 Ronin , but Women of the Night is his first significant return to the theme explored in this collection. World War II informs everything about the drama of Women of the Night, which was based on a contemporary novel about life in Japan at the time. Though, unlike the post-War films of Seijun Suzuki, Mizoguchi never addresses the problem of occupying U.S. troops, the effects of the combat are both felt and seen in the rubble and poverty that pushes his characters to the brink. Fusako (Kinuyo Tanaka) is struggling to get by and hoping her husband will return from Korea. She lives with her mother-in-law and tries to care for her sick child. The only man we see in this early portion is her alcoholic brother-in-law, who did return from service and does not like what he did or the outcome. His little sister Kumiko (Tomie Tsunoda) lost her husband to the fighting, as did many other women her age. Fusako has been selling clothes to make ends meet, and though the red light district is just around the corner, refuses to degrade herself. She suffers the one-two punch of finding out her husband is dead and finally losing her son to illness, but she maintains her dignity and even manages to secure a job with her husband's former boss. In fact, things are looking up when she is reunited with her own younger sister, Natsuko (Sanae Takasugi), who she thought lost. Natsuko has returned from Korea a widow, and she bears her own scars from the fighting. Currently, she works as a hostess in a dance club. The good times don't last. Natsuko and Fusako both strike up an affair with Fusako's boss, and when the older sister finds out, she leaves home and becomes a prostitute with the intent of punishing all men by spreading sin and disease. She believes that the men of Japan are seeking to destroy her and all women like her, so why not pre-emptively take advantage of their base desires? Her point of view is a little hard to argue with. The boss man turns out to be less than a stand-up guy, and when Kumiko tries to leave home to make her way in the world, she is taken advantage of by young male pretending to want to help. The naïve girl is deceived, raped, and pushed into prostitution herself. 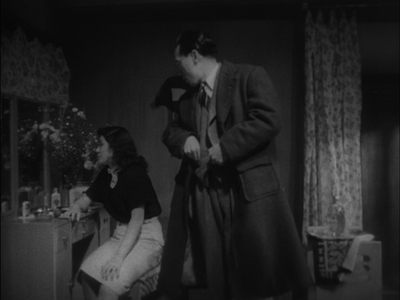 Apparently Kenji Mizoguchi had been inspired by the movies that began coming out of Italy after WWII, and there is a definite influence of the Neorealist movement in evidence in Women of the Night. 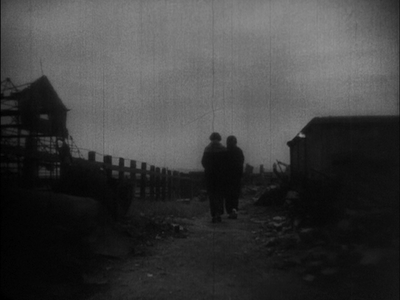 The choice between honest work and dishonest gain is not that far off from De Sica's father/son drama Bicycle Thieves [review], and much like similar ruins set the scene for Rossellini's Germany Year Zero [review], Japan's war-ravaged landscape provides a perfect backdrop for Mizoguchi's cautionary tale. Civilization has been ruined, and with it, any balance of right and wrong. The ladies in the movie will suffer all manner of humiliation and loss. Gone is any whiff of the hypocritical judgment of the common populace that made the struggles of the characters in Osaka Elegy and Sisters of the Gion [review] so difficult to traverse; replacing it is a moral obligation to set things right, one that few engage with, and those who do seem inconsequential in the face of so much decay. Mizoguchi's cast is excellent. They play their characters with nuance and, even in the worst cases, empathy. They appear to be more than simple "types," regardless of how insignificant their function in the narrative. Of particular note is the obvious divide between the sisters. Fusako is more compassionate at the start of the film, making her rejection of her previous life all the more drastic. Kinuyo Tanaka, whom Mizoguchi would use again in both Ugetsu and Sansho the Bailiff, could have easily resorted to a cartoonish transformation. There are plenty of examples of how she might have made Fusako less sympathetic; most of the other prostitutes look like the prototype for bad girls in 1950s juvenile delinquent exploitation pictures. Instead, Tanaka relies on weariness and disappointment more than bravado. She plays Fusako as a woman who has given up, and her whole demeanor changes as a result--she goes from humbly slumping in deference to her social betters to defiantly displaying who she is. Sanae Takasugi is equally as good when it comes to establishing the subtle distinctions between Fusako and Natsuko. Despite the hardships she has already endured, Natsuko has not given in to despair; rather, she has gotten crafty and she masks her troubles with an erudite manner. She is a woman that is used to being taken care of and having things paid for. 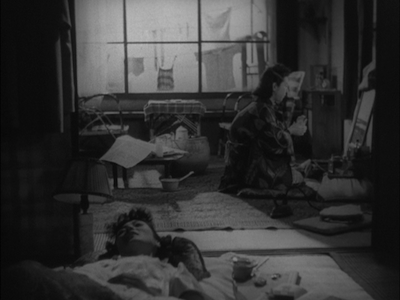 Takasugi (who later worked with both Ozu and Ichikawa) plays her as borderline haughty. She carries herself differently than the actress playing her sister. Again, you can make out their approach to life just in how they present themselves, and by the end of the film, their stance has pretty much swapped. For all her good posture, however, things don't go much better for Natsuko. There are no good choices left for these ladies. Women of the Night is an unrelenting tragedy. The downward spiral of its main characters is both dizzying and deep. Unfortunately, I think Mizoguchi tips the balance too far. 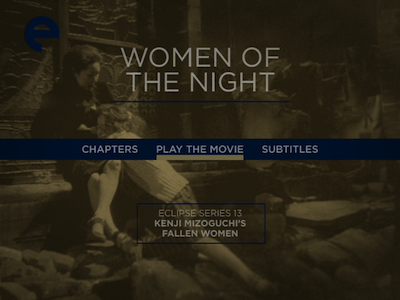 In its final 20 minutes or so, Women of the Night becomes comically overwrought. Everything goes wrong, and instead of just letting the bad stuff happen, Mizoguchi and his longtime collaborator, screenwriter Yoshikata Yoda, inflate the aforementioned moralizing, however flailing it might be, and resort to cornball histrionics. 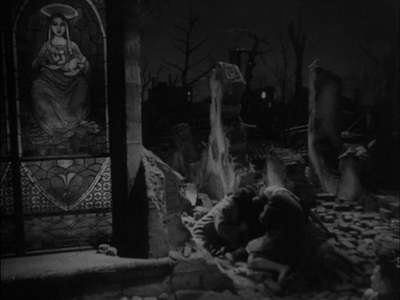 Fusako and Kumiko are reunited in a bombed-out Christian church, complete with stained-glass windows depicting the Virgin Mary and the Baby Jesus. A brawl breaks out amidst the rubble, as prostitutes who are angry that Fusako would try to rescue herself and her friend from this way of life descend on them in a frenzy of violence. It might have actually worked had Mizoguchi just let them take their beatings. 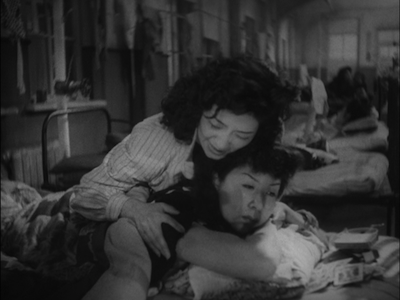 Instead, Fusako's protests move her attackers to tears, and the film ends with labored wailing and cries to the heavens. It's a bit much. The director seems to have lost his restraint in direct proportion to his main characters' loss of dignity. Goddammit, pour me another drink.